How many of you use the RMK SkinTuner Treatment before? This is a skin solution that we use after cleansing and toning. It helps to replenish the moisture back to our skin. The renewed formula of RMK Skintuner Treatment ensures that goodness of natural youth boosting ingredients are delivered to permeate, hydrate and veil multiple levels of the skin. It contains hyaluronic acid, collagen and antioxidants, the new powerful formula penetrates all three layers of the skin to provide ultimate nourishment, hydration and comfort. Starting at the surface, the skin is veiled to protect it from environmental factors and irritants, whilst the inner protective veil delivers ingredients to the heart of the cell sealing in the nutrients. The two new, key ingredients of Citrus aurantium peel and Bilberry extracts build the perfect base to protect and promote skin’s natural regenerative process and youthful appearance. Bilberry extract works to moisturise and refine the skin surface and actively supports building of a strong barrier function for problem free skin. Citrus aurantium peel extract boosts moisture levels and skin cell turn over to kick start a positive skin cell life cycle. 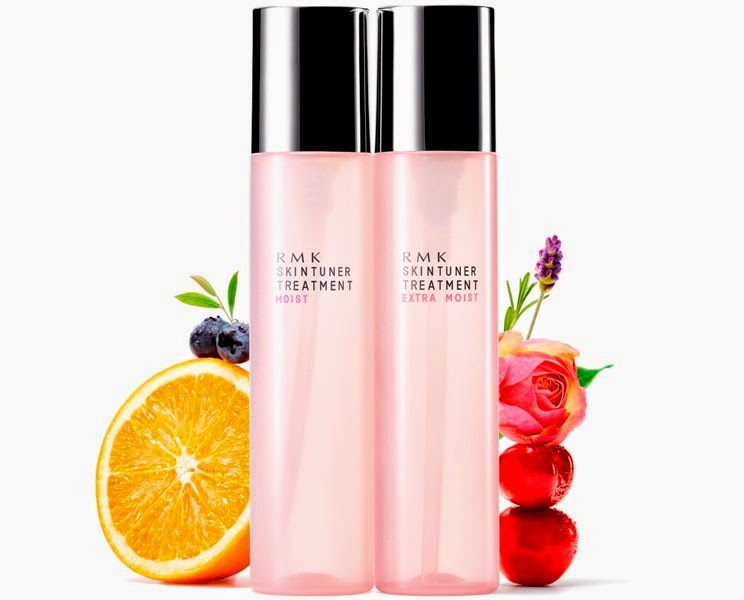 RMK Skintuner Treatment Moist is scented with notes of relaxing lavender, whilst Extra Moist exudes notes of delicate rose. RMK Skintuner Treatment Moist – with micro emulsion formula: Oil x Water for moisture / hydration to deliver goodness to all levels of the skin. It contains a luxurious blend of essential oils of relaxing Lavender and comforting Rose Wood. This is for Normal to combination skin. RMK Skintuner Treatment Extra Moist - protect and promote healthy looking skin with a double dose of Hylaluronic Acid. It contains a luxurious essential oil blend of delicate Rose and sensual Geranium. This is for dry and sensitive skin. RMK Skintuner Treatment provides multi-level hydration and protection. It is the ultimate moisture and hydration balance for youthful and glowing skin. Usage: Dispense 4 pumps into the palm of the hand or onto cotton pads and apply using circular movements. To be used daily. gently massage into the skin for optimum results. Repeat several times when applying without cotton.